5 Acres that are private, serene, and beautiful. Towering, majestic trees that filter sunlight throughtout the venue providing those shaded areas on hot summer days. 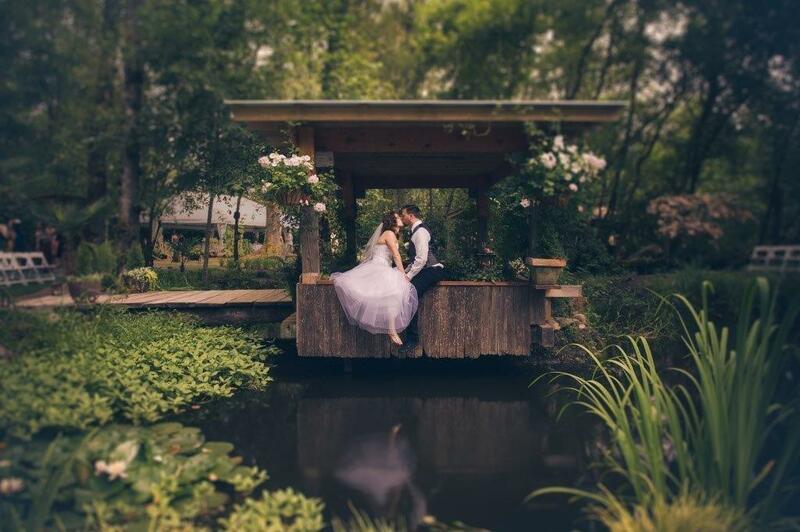 The island-on-the-pond -- your guests are seated around the pond watching you say your vows as the sunlight dances on the water, with the soothing sounds of the trickling waterfall. Relax and enjoy Maroni Meadows with us! Alcoholic beverages must be served by Bottoms Up, a licensed and insured Bartending service. The renter must obtain a banquet permit and a copy must be received by Maroni Meadows 2 months prior to your event. Banquet Permit Application. Applicant must notify Maroni Meadows in writing of a cancellation. Deposits to hold your day are non-refundable. Any monies paid on or before the scheduled payment due day are non-refundable....and there will be a $300.00 cancellation fee when cancellation is 120 days or less prior to the event's scheduled day. There are no restrictions on the caterer you choose for your event. You may also choose to self-cater. However, your catering must be self-contained. There are no kitchen facilities available to use. Children are welcome at Maroni Meadows but it is the renter's sole responsibility to see that they are supervised at all times, especially around the ponds. It is the renter's responsibility to return the facility to the condition in which it was found. The renter is responsible for removing all decorations and personal belongings. The renter is also responsible for making sure all trash is bagged and placed in the garbage containers provided. Caterers must remove and take with them off-site any food or other trash items related to their catering. In addition, the renter is responsible for removing any rented items or stacking them in a designated location for pick up by the rental company. Any additional clean up that is required by Maroni Meadows will incur a minimum charge of $75.00 per 30 minutes, which will be deducted from the damage deposit*. Maroni Meadows is not responsible for any personal items left behind after an event. Maroni Meadows is available for rental on a daily basis June, July, August and September. The hours of availability are from 10:00am To 10:00pm Friday and Saturday and 8:00pm on Sundays. Weekdays are also an option. The renter agrees to take responsibility for any and all injury to persons or damage to property during your use of the premises. The renter agrees to hold Maroni Meadows harmless of all liabilities resulting from any damage or injuries suffered by you, your guests, or your vendors caused while you are on the property of Maroni Meadows. Maroni Meadows is not responsible for items lost, stolen or left by renters, members of the wedding party, guests or vendors. A certificate of insurance in the amount of $1,000,000 (alcohol box checked) naming Maroni Meadows as the certificate holder must be obtained through your homeowners insurance or at WedSafe or at Event Helper. A rehearsal period of one hour will be scheduled at no cost during the week before your wedding or event. Reservations are taken on a first come first basis. A signed rental agreement and a nonrefundable deposit of $1000.00 is required to hold your date. Payments then are divided into 3 payments: 6 month, 4 month and the balance being paid 2 months before your day. All monies paid are non refundable. We accept cash or checks. A damage deposit of $400.00 (separate check) is required one month prior to your event. The damage deposit is fully refundable and will be returned to you within 14 days after your event provided there is no damage or additional charges. No rice, confetti, fake petals (real ones ok) and no water marbles. There will be an extra $50.00 charge for single wrapped candy. Dogs - only for ceremony.